YP Simplified Series. 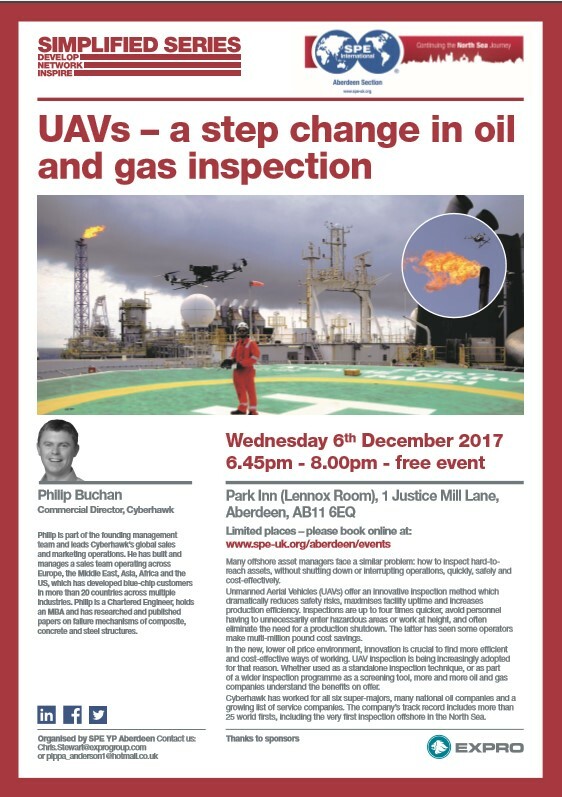 UAVs – A Step Change in Oil and Gas Inspection by Philip Buchan, Cyberhawk. YP Simplified Series presents: A Step Change in Oil and Gas Inspection by Philip Buchan, Commercial Director, Cyberhawk. Many offshore asset managers face a similar problem: how to inspect hard-to-reach assets, without shutting down or interrupting operations, quickly, safely and cost-effectively. Unmanned Aerial Vehicles (UAVs) offer an innovative inspection method which dramatically reduces safety risks, maximises facility uptime and increases production efficiency. Inspections are up to four times quicker, avoid personnel having to unnecessarily enter hazardous areas or work at height, and often eliminate the need for a production shutdown. The latter has seen some operators make multi-million pound cost savings. In the new, lower oil price environment, innovation is crucial to find more efficient and cost-effective ways of working. UAV inspection is being increasingly adopted for that reason. Whether used as a standalone inspection technique, or as part of a wider inspection programme as a screening tool, more and more oil and gas companies understand the benefits on offer. Cyberhawk has worked for all six super-majors, many national oil companies and a growing list of service companies. The company’s track record includes more than 25 world firsts, including the very first inspection offshore in the North Sea. Philip is part of the founding management team and leads Cyberhawk’s global sales and marketing operations. He has built and manages a sales team operating across Europe, the Middle East, Asia, Africa and the US, which has developed blue-chip customers in more than 20 countries across multiple industries. Philip is a Chartered Engineer, MBA and has researched and published papers on failure mechanisms of composite, concrete and steel structures.